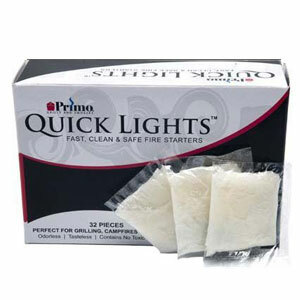 Primo Quick Lights for Primo Ceramic Barbecue Grills make lighting the charcoal in your Primo ceramic grills. There are 24 quick lights to a box. Each quick light strikes easily on the side of the box. After that, all you have to do are put a few quick lights in strategic areas around the natural charcoal pile and sit back while the charcoal takes care of itself. WARNING: Burning charcoal in this product can expose you to checmicals including carbon monoxide which is know by the State of California to cause birth defects or reproductive harm. For more information go to www.P65Warnings.ca.gov.